Perth, in Western Australia, has quite a few things going for it: It’s a wealthy city, modern, and it straddles the Swan River. It is also surrounded by a wide range of great outdoor activities from the beach to the (relatively) nearby Nambung National Park. The city is also surrounded by farmland and wineyards, giving rise to some truly great food. And restaurants. In fact, there are over 1,000 restaurants in a city of 1.83 million residents. Among these, there’s a great selection of steak restaurants. 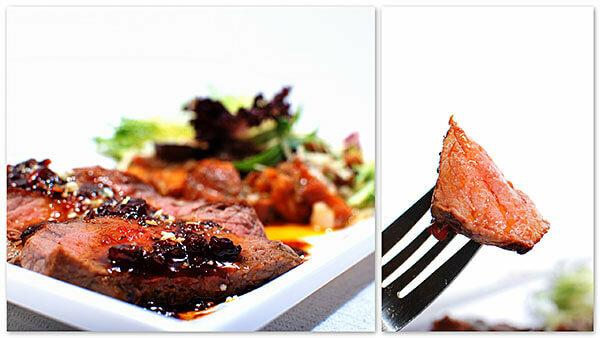 This steak restaurant is an upmarket offering in the Crown Perth complex. With understated decor, great service, and the steak is cooked perfectly to order. As the name implies, there’s not just grilled beef on the menu, but a full selection of lamb, chicken, and especially seafood is highlighted as well. The beef is either Cape Grim grassfed, Wagyu, or Rangers Valley grain fed, so full of flavors. Food here is local, and quite Australian in feel for the mains. With starters and side dishes, inspiration comes from Morocco, Mexico, France, and even Spain. A solid choice for entertaining or simply a relaxed dinner. Go for the steak. Usually a busy choice on the weekends, this large and popular steakhouse offers the usual choices. But there’s also the Hunters or Chicken Assaghai, spare ribs done with South African flavors, or a variety of salads. The beef is either Angus or Wyagu, so chock full of flavors. Service is solid, but the decor does split opinion with its somewhat utilitarian steel chairs and stools at counters giving it an updated cafeteria feel. South African by nature, and service is good. A fantastic choice if you’re looking for something grilled and not beef, as the menu ranges from crocodile, through seafood and chicken and of course great beef. Order some of the local Kariba Wheat Beers, or the imported South African wine which’ll go perfectly with your dishes. Zebras has been around for the past 20 years and has in that time built quite a loyal following. Full on Australian steakhouse which is a Perth favorite. It’s part of the Hilton hotel, but it being a ‘hotel restaurant’ shouldn’t put you off. Consistently good service and with a relaxed atmosphere. Meat is done perfectly here, as it should be. But the rest of the menu stands out as well, with salads being outstanding. Reviewers praise the fries too (called “chips” in Australia) as some of the best on offer anywhere. As for the bar, there are 14 local beers on the menu! Western Australia is well known as a beer lover’s paradise offering lots of microbreweries, so don’t get too carried away. A great value for money steakhouse option in the Woodlands neighborhood, overlooking Jackadder Lake. Consistently receives high grades in reviews and offers a full variety of steak. Besides great steak, there’s a selection of seafood dishes, chicken, and salads to suit anyone in your party. Portions are big and cooked with skill. The décor is nice white table linens with modern fittings, and behind a large bar, there’s a glass-fronted kitchen so you can watch your meat being cooked up for you. Perth does offer a few other steakhouses, but most tend to get quite unfavorable reviews so best avoided. This list of 5 should definitely get you tucked into a nice tender steak. Last updated by jack on 26 January, 2013 in Food And Drink.